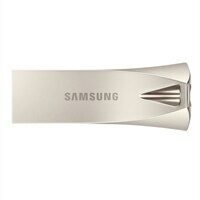 Samsung BAR Plus MUF-32BE3 - USB flash drive - 32 GB - USB 3.1 - champagne silverA modern take on a classic. The next generation Bar Plus elevates the flash drive to an everyday essential, offering impressive speeds in a striking design. Fits in your hand, a pure minimalism that cleverly blends style, speed, and reliability. Get your time back. Fast and convenient read speeds up to 300 MB/s with a USB 3.1 standard gives you more time to work, play, watch, and create. Send a 3GB 4K UHD video file from your Bar Plus to your PC in just 10 seconds. A modern take on a classic. The next generation Bar Plus elevates the flash drive to an everyday essential, offering impressive speeds in a striking design. Fits in your hand, a pure minimalism that cleverly blends style, speed, and reliability.